What a day The Tribune chose to publish this article by Dr. Francesca Cassio who is the Chair of Sikh Musicology at the Hofstra University, Long Island, New York – I would have rather accepted a genuine apology from Ashish Choudhary IPS, a foolhardy (now a former) SSP of Kapurthala, Devinder Singh PPS, former DSP of Sultanpur Lodhi, Harpreet Singh PP, the erring SHO of Sultanpur Lodhi who has broken every single law, well almost for he did not live out his threat to arrest the innocent teenage students of Anad Conservatory nor did he kill or order anyone to be physically harmed except threatening with the same! An apology will also expected from some of the other policemen and policewomen staff even if they were only following orders from rogue and unlawful intent bearing seniors including the police station Munshi, Puran Chand, along with the petty political leaders who have now proved beyond doubt whatsoever to be a sorry burden to even political party, Akali Dal, for having orchestrated the worst humiliation and sacrilege of Punjab’s heritage as well as such unfortunate desecration of Gur-Sikh manuscripts including those of Gurbani. Each one of these uniformed criminals will have to unconditionally offer the same (apology) not just to the students and staff of the Anad Conservatory upon who they have left such a physical and mental trauma but also to the citizens of Sultanpur Lodhi as well as to the people of this nation. 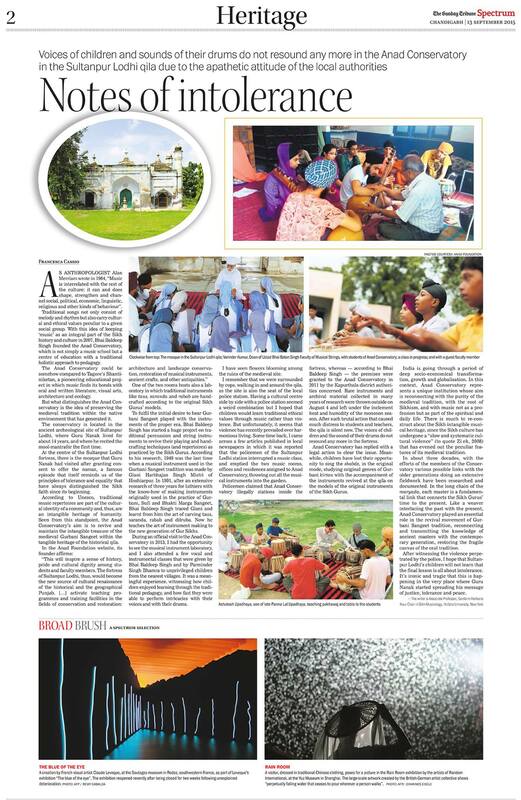 Nevertheless, this article is indeed a healing balm and believe me, this Police Station and its staff will be evicted from the Qila very shortly and the students will again begin to celebrate and learn the extraordinary heritage endowed to us by Guru Nanak —thanks to his Udasis and his vision of a new India where all diversity is respected, celebrated and honoured! I’m so happy to get this news!! Seems like there is a victory after all! !